The 2015 FIFA Women's World Cup was the seventh FIFA Women's World Cup, the quadrennial international women's football world championship tournament. The tournament was hosted by Canada for the first time and by a North American country for the third time. Matches were played in six cities across Canada in five time zones. The tournament began on 6 June 2015, and finished with the final on 5 July 2015 with a United States victory over Japan. The 2015 tournament saw the World Cup expanded to 24 teams from 16 in 2011. Canada's team received direct entry as host and a qualification tournament of 134 teams was held for the remaining 23 places. With the expanded tournament, eight teams made their Women's World Cup debut. All previous Women's World Cup finalists qualified for the tournament, with defending champions Japan and returning champions Germany (2003, 2007) and the United States (1991, 1999) among the seeded teams. The 2015 tournament used goal-line technology for the first time with the Hawk-Eye system. It was also the first World Cup for either men or women to be played on artificial turf, with all matches played on such surfaces, even though there were some initial concerns over a possible increased risk of injuries. Zimbabwe withdrew its bid on 1 March 2011. The country was seen as a long shot as its women's team was ranked 103rd in the world at the time of the bid and has never qualified for a Women's World Cup. There is also ongoing political and economic instability in the country. The selected host, Canada, had previously hosted FIFA tournaments including the 1987 FIFA U-16 World Championship, 2002 FIFA U-19 Women's World Championship, the 2007 FIFA U-20 World Cup, which set an attendance record for that tournament, and most recently the 2014 FIFA U-20 Women's World Cup. After North Korea had several players test positive for performance-enhancing drugs during the 2011 FIFA Women's World Cup, FIFA banned the North Korean team from participating in the 2015 FIFA Women's World Cup in Canada. This was the first time a women's team had been banned from a Women's World Cup, and it was the first time since 1995 that North Korea did not participate in a Women's World Cup. The latest published FIFA Rankings prior to the tournament (March 2015) are shown in brackets. The cities of Vancouver, Edmonton, Winnipeg, Ottawa, Montreal and Moncton were selected to host tournament matches. Halifax was also considered, but removed itself from contention in March 2012. Toronto decided not to bid, due to potential conflicts with the 2015 Pan American Games. Due to FIFA's policy against commercial sponsorship of stadium names, Investors Group Field in Winnipeg and TD Place Stadium in Ottawa were respectively known as Winnipeg Stadium and Lansdowne Stadium during the tournament. Seating capacities shown in table below are as configured for these FIFA games. The tournament introduced goal-line technology with the Hawk-Eye system by which it is possible to show on the stadium screen if the ball was in or not. It was also the first World Cup for either men or women to be played on artificial turf, with all matches played on such surfaces. There were some initial concerns (please see below) over a possible increased risk of injuries from playing on artificial turf, but a legal challenge suggesting matches should be played on grass as in similar men's tournaments was dropped in January 2015. Each team's squad for the 2015 FIFA Women's World Cup consisted of 23 players (three of whom must be goalkeepers), two more than the 2011 tournament, and the same number as men's World Cup squads. Each participating national association was required to confirm its final 23-player squad no later than 10 working days before the start of the tournament. Replacement of seriously injured players was permitted until 24 hours before the team in question's first World Cup game. The squads were officially announced by FIFA on 28 May 2015. Formiga of Brazil and Homare Sawa of Japan were included in World Cup squads for the sixth time, a record for any men or women players. A total of 22 referees, 7 support referees, and 44 assistant referees were selected for the tournament. The 24 teams of the tournament were arranged into 6 groups labelled A to F. The provisional match schedule for the tournament was released on 21 March 2013, with the hosts, Canada, placed in position A1. The final schedule with match times was released on the same day right after the draw was made. The first round, or group stage, saw the twenty four teams divided into six groups of four teams. Each group was played in a round-robin-format of six games, where each team played one match against each of the other teams in the same group. Teams were awarded three points for a win, one point for a draw and none for a defeat. The winners and runners-up from each group, as well as the best four third-placed teams, qualified for the first round of the knockout stage. The four best third-placed teams from the six groups advanced to the next stage along with the six group winners and six runners-up. The ranking of the third-placed teams were determined by the "rules for classification" listed below the table (that is, ranked by columns Pts, GD, and GF in sequence; then by drawing lots). In the next stage the four third-placed teams were matched with the winners of groups A, B, C and D according to a table published in Section 28 of the tournament regulations. The knockout stage comprises the 16 teams that advanced from the group stage of the tournament. There are four rounds of matches, with each round eliminating half of the teams entering that round. The successive rounds are the round of 16, quarter-finals, semi-finals, and the final. There is also a match to decide third and fourth place. For each game in the knockout stage, any draw at 90 minutes is followed by 30 minutes of extra time; if scores are still level, there is a penalty shootout to determine who progresses to the next round. Single yellow cards accrued will be cancelled after the quarter-finals, therefore ensuring that no players miss the Final because of receiving a caution in the semi-finals. Three spots in the 2016 Summer Olympics women's football tournament were filled by the UEFA teams that progress the furthest in the tournament, other than England. [n 2] Two spots went to France and Germany which both reached the quarter-finals. The third spot was a tie between four teams eliminated in the round of 16: Netherlands, Norway, Sweden and Switzerland. A play-off tournament in March 2016 determined UEFA's third Olympic qualifier to be Sweden. The total prize money offered by FIFA for the tournament was US$15 million, which represents 2.6% of the total prize money for the 2014 Men's World Cup ($576 million). The winning team, United States, received $2 million, representing 5.7% of the amount received by Germany for winning the 2014 Men's World Cup ($35 million). There were 146 goals scored in 52 matches, for an average of 2.81 goals per match. All of the tournament's venues had fields composed of artificial turf, which some players believe results in a higher risk of injuries to players. More than 50 players protested the use of the surface instead of grass on the basis of gender discrimination. They filed a lawsuit challenging FIFA's decision to play on artificial turf, claiming FIFA would never allow the men's World Cup to be played on "unsafe" artificial turf and thus the organizers had violated the Canadian Human Rights Act. 2012 Women's World Player of the Year Abby Wambach noted "The men would strike playing on artificial turf." The controversial issue of gender equality and an equal playing field for all sparked debate in many countries around the world. An application filed on 1 October 2014 with the Ontario Human Rights Tribunal by a group of women's international soccer players against FIFA and the Canadian Soccer Association noted that, in 1994, FIFA spent $2 million to plant natural grass over artificial turf in New Jersey and Detroit. Some celebrities and prominent players showed their support for the women soccer players in defence of their lawsuit, including United States men's team keeper Tim Howard. Even with the possibility of boycotts, FIFA's head of women's competitions, Tatjana Haenni, made it clear "We play on artificial turf and there's no Plan B." In January 2015, the lawsuit was withdrawn by the players. Fox commentator Julie Steward-Binks measured the turf temperature at several games. On 21 June at the Canada vs Switzerland round of 16 game in Vancouver, she reported that her thermometer was "officially broken". Her thermometer appears to max out at 120 °F (49 °C). During the tournament, Australian striker Michelle Heyman slammed the playing conditions, saying the turf is like "walking on hot coals" and the players feet "just turn white, your skin is all ripped off". Prior to the start of the Australia vs Japan quarterfinal in Edmonton on 27 June, Fox commentator Kyndra de St. Aubin measured the air temperature at 82 °F (28 °C) and the turf temperature at 150 °F (66 °C). Despite such dangerous conditions, officials decided against taking cooling breaks during the match because the air temperature was under 32 °C (90 °F). As the game wore on, players appeared noticeably exhausted due to the playing conditions. Fox Sports' studio for the World Cup at Jack Poole Plaza; the tournament marked one of their first under a new broadcasting contract with FIFA. The 2015 FIFA Women's World Cup was one of the first FIFA tournaments under new rights deals in two North American markets. In its host country of Canada, Bell Media acquired the broadcast rights; the competition was televised by CTV and TSN in English, and Réseau des sports (RDS) in French. In the United States, English-language television rights were held by Fox Sports with coverage carried on the main Fox broadcast network, along with the Fox Sports 1 and Fox Sports 2 pay TV channels. Spanish-language rights were held by Telemundo and sister cable network NBC Universo. Fox constructed a temporary studio for the Women's World Cup at Jack Poole Plaza in Vancouver, located outside the Vancouver Convention Centre. In December 2014, the European Broadcasting Union extended its rights to FIFA tournaments for its members in 37 countries, including the 2015 Women's World Cup. In the United Kingdom, all matches from the tournament were shown by the BBC via BBC One, BBC Two, BBC Three and BBC Red Button on TV and Radio 5 Live on radio. In Australia, SBS aired all 52 matches live online, and televised 41 matches live, with the only matches not televised live being those which aired concurrently. On 17 June 2014, the mascot of the tournament, Shuéme, a female great white owl was unveiled at the Canadian Museum of Nature in Ottawa. The five top-tier sponsors were Coca-Cola, Adidas, Hyundai–Kia, Visa, and Gazprom. In the final week of the tournament, the Canadian government added Gazprom to a list of organizations sanctioned for supporting the Russian annexation of Crimea. Media suggested the addition was delayed to reduce embarrassment to FIFA. ^ Despite having a lower FIFA ranking, Brazil was seeded ahead of Sweden for geographical reasons. Before the draw, the Organizing Committee placed the seeded teams in the following groups: Germany in Group B, Japan in Group C, United States in Group D, Brazil in Group E, and France in Group F; Canada were already in Group A as the tournament host. Not drawing the groups for the seeded teams has drawn some criticism. A FIFA spokesperson later confirmed that teams were allocated to certain groups for promotional reasons. ^ Even though England were one of the top three UEFA teams in the World Cup, they were not eligible to play at the Olympics. The English Football Association (FA) is affiliated to the British Olympic Association and on 2 March 2015 said it wanted a British Olympic team to compete if England earned a place. Following strong objections from the Scottish, Welsh and Northern Irish football associations, and a commitment from FIFA that they would not allow entry of a British team unless all four Home Nations agreed, the FA announced on 30 March 2015 that they would not seek entry into the Olympic tournament. Similar circumstances prevented them from playing in the 2008 Olympics, when England finished as one of the top three UEFA teams in the 2007 FIFA Women's World Cup. Great Britain did compete in 2012 as the host nation. ^ a b Šašić and Lloyd had the same number of goals and assists (6 goals, 1 assist). Šašić won the Golden Boot due to having played fewer minutes. ^ "FIFA Women's World Cup Canada 2015™ - Matches - USA-Japan - FIFA.com". FIFA.com. Retrieved 6 July 2015. ^ a b Kessel, Anna. "Biggest Women's World Cup to kick off in Canada amid surface tension". The Guardian. Retrieved 1 June 2015. ^ "USA Draws The 'Group of Death' In 2015 Women's World Cup". Five Thirty Eight. Retrieved 1 June 2015. ^ "Remarkable interest in hosting FIFA competitions". FIFA. 17 January 2011. Retrieved 21 July 2011. ^ "Zimbabwe withdraws bid to host 2015 Women's World Cup". BBC. Retrieved 22 February 2012. ^ Reed, Nigel (21 February 2011). "2015: The case for Canada". Cbc.ca. Retrieved 22 October 2012. ^ "Qualification slots for Canada 2015 confirmed". FIFA.com. 11 June 2012. ^ "FIFA Disciplinary Committee decisions for Germany 2011". 25 August 2011. Retrieved 12 June 2013. ^ "Women's Ranking (27 March 2015)". FIFA.com. 27 March 2015. ^ "FIFA Women's World Cup Canada 2015™ Host Cities unveiled". FIFA.com. 4 May 2012. Retrieved 16 December 2014. ^ "No Halifax stadium for soccer World Cup". The Chronicle Herald. 27 March 2012. Retrieved 22 October 2012. ^ "Canadian host cities for 2015 Women's World Cup unveiled". CBC.ca. 4 May 2012. Retrieved 4 May 2012. ^ "FIFA Women's World Cup Canada 2015™ Destination: Winnipeg". FIFA. Retrieved 4 January 2015. ^ "FIFA Women's World Cup Canada 2015™ Destination: Ottawa". FIFA. Retrieved 4 January 2015. ^ "Women's World Cup: Hawk-Eye used in Canada tournament". BBC Sport. 31 March 2015. ^ "Hawk-Eye confirmed as goal-line technology provider for Canada 2015". FIFA.com. 31 March 2015. ^ Rubin, Josh. "Women drop artificial turf complaint over 2015 World Cup in Canada". Toronto Star. Retrieved 1 June 2015. ^ a b c d e f "Regulations FIFA Women's World Cup Canada 2015™" (PDF). FIFA.com. ^ "Stellar names lined up for Canada 2015". FIFA.com. 28 May 2015. 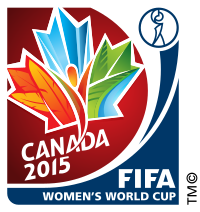 ^ "FIFA Women's World Cup Canada 2015™ – List of Players" (PDF). FIFA.com. ^ "Japan legend Sawa makes cut for sixth World Cup". Reuters. 1 May 2015. Retrieved 28 May 2015. ^ "22 referees, 7 support referees and 44 assistant referees appointed for FIFA Women's World Cup 2015™". FIFA.com. 30 March 2015. ^ "Referees and Assistant Referees for the FIFA Women's World Cup Canada 2015™" (PDF). FIFA.com. ^ "Final Draw to take place on 6 December". FIFA.com. 22 June 2014. ^ "Details of Final Draw for Canada 2015". FIFA.com. 5 December 2014. ^ "Equalizer Soccer – Brazil, Canada, France, Germany, Japan, USA seeded teams for Women's World Cup Draw". equalizersoccer.com. Retrieved 17 June 2015. ^ "Equalizer Soccer – Assigning seeded teams to groups compromises integrity of Women's World Cup Draw". equalizersoccer.com. Retrieved 17 June 2015. ^ "Sverige snuvat på toppseedning". svt.se. Retrieved 17 June 2015. ^ "Canada 2015 hopefuls learn fate in Ottawa". FIFA.com. 6 December 2015. ^ "Frauen-WM 2015: Gruppenauslosung verkommt zur Farce" (in German). Framba.de. 6 December 2014. Archived from the original on 23 September 2015. ^ "Results of the Women's World Cup draw include a group of death and controversy". SB Nation. 6 December 2014. ^ "USA Draws The 'Group of Death' In 2015 Women's World Cup". FiveThirtyEight.com. 6 December 2014. ^ "Equalizer Soccer – FIFA explains why 2015 Women's World Cup is rigged". equalizersoccer.com. ^ FIFA Women's World Cup 2015 match schedule published. FIFA.com. 21 March 2013. Retrieved 21 March 2013. ^ "Match Schedule FIFA Women's World Cup Canada 2015" (PDF). FIFA.com. 16 February 2015. ^ "Calculators and cards: The qualification and disciplinary lowdown". FIFA.com. 12 June 2015. ^ "Germany and Norway drawn together". UEFA.com. 6 December 2014. ^ "Olympic play-off dates set". UEFA.com. 10 October 2007. ^ "Germany, France qualify for Rio 2016". FIFA. 23 June 2015. Retrieved 23 June 2015. ^ "European contenders impress in Canada". UEFA.com. 18 June 2015. ^ "Sweden seal Europe's last ticket to Rio". FIFA.com. 9 March 2016. ^ "Lloyd, Solo and Sasic lead the way". FIFA.com. 6 July 2015. ^ "FIFA announces shortlists for FIFA Women's World Cup 2015 awards". FIFA.com. 2 July 2015. ^ "Canada 2015 Technical Report published, All-Star Squad announced". FIFA.com. ^ "2015 FIFA Women's World Cup Dream Team". FIFA.com. ^ a b "World Cup money pot increased to $576m". reuters.com. Retrieved 7 July 2014. ^ "Statistics – Players – Top goals". FIFA.com. ^ "FIFA visit to Moncton stadium overshadowed by turf lawsuit". CBC News. 2 October 2014. Retrieved 11 November 2014. ^ Fox Sports. "USWNT stars not backing down on artificial playing surface stance". Fox Sports. Retrieved 9 October 2014. ^ "elite female players sue". espnW. Retrieved 9 October 2014. ^ "FIFA: The World Cup Should Be Played on Natural Grass". Retrieved 9 October 2014. ^ "Equalizer Soccer – Players officially file lawsuit against FIFA, CSA over artificial turf at 2015 Women's World Cup". Retrieved 9 October 2014. ^ "Elite players file application with Ontario human rights body alleging gender discrimination over artificial turf at 2015 Women's World Cup". National Post. Retrieved 9 July 2015. ^ "Players file lawsuit in Canada over artificial Women's World Cup turf". Global News. 1 October 2014. Retrieved 9 October 2014. ^ "FIFA officials to inspect BC Place turf in light of controversy". Global News. 7 October 2014. Retrieved 9 October 2014. ^ "Women's World Cup players withdraw 'turf war' lawsuit against FIFA, Canada Soccer Association". Washington Post. 21 January 2015. Retrieved 8 May 2015. ^ "Canada vs Switzerland". Twitter. 21 June 2015. Retrieved 30 June 2015. ^ "Matildas say synthetic turf 'like hot coals'". Sydney Morning Herald. 25 June 2015. Retrieved 30 June 2015. ^ "Australia vs Japan quarterfinal". Twitter. 27 June 2015. Retrieved 30 June 2015. ^ "Bell Media lands deal for FIFA soccer from 2015 through 2022". TSN.ca. Archived from the original on 12 December 2013. Retrieved 18 February 2014. ^ "FiFA awards further TV rights". FIFA. Retrieved 5 July 2013. ^ "FIFA awards U.S. TV Rights". FIFA. Retrieved 5 July 2013. ^ "Screen goes dark on women's soccer game, Vancouver fans go ballistic". The Province. Archived from the original on 9 June 2015. Retrieved 9 June 2015. ^ "Fox Sports transforms Vancouver Convention Centre into FIFA broadcast studio". CBC News. Retrieved 7 July 2015. ^ "EBU & FIFA conclude media rights agreement". EBU. Retrieved 8 December 2014. ^ "Women's World Cup on the BBC". bbc.co.uk/sport. BBC. Retrieved 6 June 2015. ^ Knox, David (14 May 2015). "FIFA Women's World Cup on SBS". TV Tonight. Retrieved 14 May 2015. ^ "FIFA Women's World Cup Canada 2015™ unveils official mascot". FIFA.com. 17 June 2014. ^ Berthiaume, Lee (8 July 2015). "Russian sponsor of FIFA world cup sanctioned as tournament ended". Ottawa Citizen. Retrieved 8 July 2015. Wikimedia Commons has media related to FIFA Women's World Cup 2015.